The Nightjar was a British carrier based fighter aircraft of the early 1920s. It was a modification of the earlier Nieuport Nighthawk fighter produced by Gloster after the Nieuport & General company, who designed the Nighthawk closed down. 22 were converted, serving with the British Royal Air Force from 1922 to 1924. The Nieuport & General Aircraft Co Ltd was formed before the start of the First World War to license produce French Nieuport aircraft. During 1917, hiring Henry Folland as chief designer, the company started to design its own aircraft, with the first type, the Nieuport B.N.1 fighter flying early in 1918. 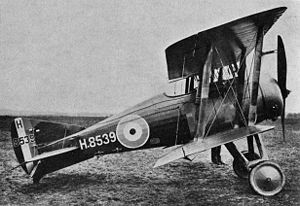 Folland designed the Nieuport Nighthawk fighter to meet the requirements of RAF Specification Type 1 which specified using the ABC Dragonfly radial engine, first flying in April 1919. During initial evaluation, this showed excellent performance, and was ordered into production. The Dragonfly engine, however, proved hopelessly unreliable, and none of the Dragonfly powered Nighthawks that were completed entered service. Nieuport & General closed down in August 1920, and the rights to the Nighthawk were purchased by the Gloster Aircraft Company, who hired Folland as chief designer. Gloster proceeded to produce a number of derivatives of the Nighthawk, calling them Gloster Mars, with variants being sold to Japan (Gloster Sparrowhawk) and Greece, and being evaluated by the RAF. The final derivative of the Nighthawk was the Gloster Mars X, also known as the Nightjar. This was intended as a single seat shipboard fighter to replace Sopwith Camels aboard the Royal Navy's aircraft carriers. It was a simple conversion of surplus Nighthawks, with the Bentley BR2 rotary engine (which was readily available from surplus stocks) replacing the Dragonfly. The Nightjar was a two-bay biplane of wooden construction, and was fitted with a new, wide-track undercarriage, with jaws fitted to act as Arresting gear for use with the fore and aft arrestor cables then in use on British aircraft carriers. The first Nightjar was delivered for evaluation by the Aeroplane and Armament Experimental Establishment in May 1921. A total of 22 Nighthawks were converted to Nightjars in 1922. The Nightjar entered service with 203 Squadron at RAF Leuchars in June 1922 . Six Nightjars of 203 Squadron were deployed aboard HMS Argus in September 1922, when Argus sailed for the Dardanelles during the Chanak Crisis. The Nightjar continued to serve with fighter flights aboard Royal Navy aircraft carriers until replaced by the Fairey Flycatcher in 1924. Two fixed forward firing .303 in Vickers machine guns.